Over the next several months, Google’s free Product Search feature will start costing ecommerce sites a lot more. Since the launch of Google’s Froogle in 2002, Google has provided a free product search service. The newly launched Google Shopping marks the first time that the company has converted a free service to a pay-for-placement model. Search marketers wonder, what does this mean to organic search? For those who focus purely on search engine optimization, the change may actually be a positive. Some of the placement tests for Google Shopping results actually improve the organic results’ position on the page compared with other paid modules. For example, a search for “teddy bears” before the move to Google Shopping would have resulted in the result at left below. The shopping results are beneath the paid results, pushing the organic search results lower on the page. We can only see one full organic result in this image, and the top of the second. Comparison of Google shopping results placement. Today’s shopping results are still in flux as Google tests the best placement for these new ads, but many of the placement experiments are appearing in the upper right. 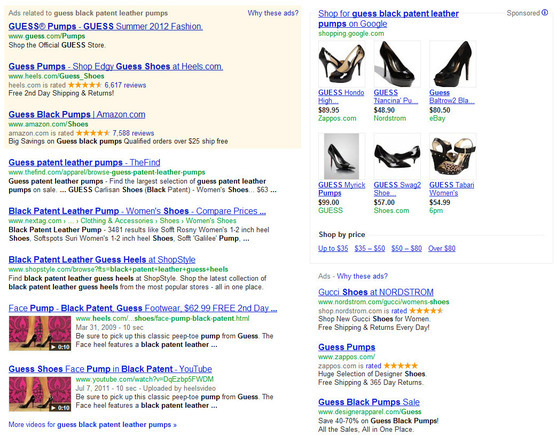 In the example above and to the right, the shopping results appear as an anchor point for the paid search ads, to the right of the top block and above the right block. As a result, Google is able to squeeze two more organic results into the same space that the previous shopping module had taken up. The experiments are still running, however, with the full launch set for sometime this fall. Until then, Google will likely continue to test and revise placement of the shopping modules to find the balance it needs to strike between revenue and searcher satisfaction. Expect to see larger and smaller modules, different formats and different placements during this transition period. With individual searches producing experimental experiences like the ones below, the true impact on organic search performance will likely be difficult to determine for some months yet. Style and placement of Google Shopping ads varies. The majority of the marketing world will not see this change with purely SEO eyes, of course. For most, Google Shopping will likely represent more downside than upside as tight budgets and human resources are stretched even further. Even the relative positive possibility of more organic visibility would be countered with a decrease in real estate dedicated to paid ads. Google claims that relevance and shopping-result quality will increase as companies are forced to manage their data feeds more closely once payment comes into play. According to Google’s blog, “Higher quality data—whether it’s accurate prices, the latest offers or product availability—should mean better shopping results for users, which in turn should create higher quality traffic for merchants.” While there’s some logic to this, it will also have the side effect of forcing ecommerce sites with fewer resources out of Google Shopping, effectively ending what had to this point been a free source of traffic. For more information on managing the transition to paid placement, see “Google Shopping: Preparing for Paid Listings,” our previous article on that topic. In addition to design experiments, Google is also experimenting with product types content. The first of these noted has been a product type ad for tents, with types of tents listed rather than images of specific tents from specific stores. Logically, this makes a great deal of sense and is consistent with Google’s practice of including lists of related keyword phrases. The product type ads turn the related links into visual cues, however, leading the searcher deeper into Google Shopping. 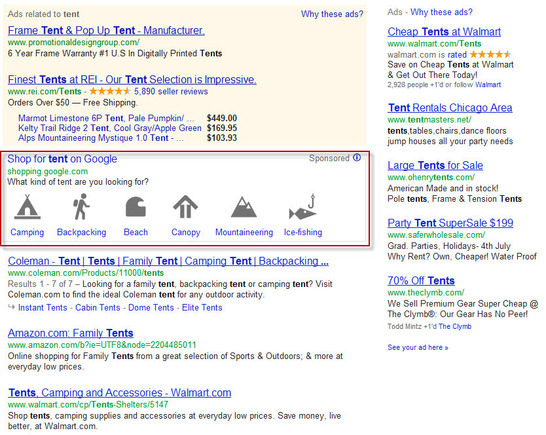 Google product type ad for “tent”. The addition of product type ads is a very calculated move for Google. The highest number of searches is for single words like “tent” or “shoes.” While Google is very good at determining intent, a single word doesn’t give enough context to determine if a search is informational or transactional. When searchers type “tent,” do they want to know how to pitch a pup tent, or do they want to buy a mountaineering tent? The product type ad gives more specific ecommerce-related choices to help determine intent, while at the same time shepherding the searcher down the Google Shopping path and away from the organic search results. We’re so accustomed to and drawn toward icons as helpful navigational tools that some searchers may not even realize that they’re segmenting their search results to see shopping results only. Google Shopping has a lot going for it. Most obviously, as a new moneymaker Google is now incentivized to make sure Google Shopping thrives as a paid advertising program. In addition, however, Google Shopping also benefits from subtler visual linking cues. Images draw the eye. Where the eye goes, the click is likely to follow. When faced with a page of black and blue on yellow and white, the images definitely attract eyeballs. Organic search can use smaller visual clues in the form of rich snippets to help attract eyeballs and clicks as well. For example, shoe etailer Heels.com uses an older form of video rich snippets to fight for eye share in the crowded search results page landscape. The resulting video — filmed with a striking hot pink background — still draws the eye right past organic listings one through three to its number four ranking. Search result showing Heels.com’s rich snippet and Google Shopping ads. Other types of rich snippets —see Google’s description — can also be coded in using microdata, as a way to label content to describe a specific type of information, such as reviews, person information, or events. The microdata isn’t visible to users, but it helps search engines identify information or media that can be used to improve the search result snippet. The reviews and ratings stars, recipe images and author mug shots seen in search results are all placed there thanks to the use of microdata in the hosting web site. Ecommerce sites wanting to battle for eye share should get started today incorporating microdata into ecommerce sites to trigger rich snippets.